Sally McDonnell Barksdale Honors College students Neal McMillin (left) and Hunter Nicholson are heading to Scotland this summer as Barksdale Award winners. Photo by Kevin Bain. 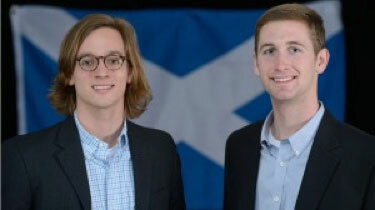 Two University of Mississippi students have been selected to travel to Scotland this summer to pursue their dreams. Neal McMillin of Madison and Hunter Nicholson of Brandon, both juniors in the UM Sally McDonnell Barksdale Honors College, are the 2013 winners of the Barksdale Awards. The $5,000 award supports creative, courageous projects developed by students who are willing to take risks with their time and efforts and who propose ambitious, independent programs of study, research or humanitarian work. The Barksdale awards were established in 2005 to encourage students to test themselves in environments that don’t have the built-in safeties of a classroom, teaching lab or library. McMillin and Nicholson are the 13th and 14th students to win Barksdale Awards, and they will be eyewitnesses to an explosive conjunction of place and time, said Douglass Sullivan-González, dean of the Honors College. McMillin will be investigating developments in Scotland’s wave and tidal renewable energy industry. He will meet with public officials, leaders in university environmental centers and renewable energy businesspersons, while visiting key development sites. These experiences will inform his thesis as he explores the circumstances surrounding times when two historically underdeveloped areas, Scotland and the American South in the 1930s, became leaders in hydroelectric innovation. As a competitive swimmer and lifeguard, McMillin has had a lifelong interest in the water that developed into a new, personalized concern for the environment. McMillin, a Newman and Barnard Scholar, said the Barksdale award gives him an opportunity to return to the birthplace of his personal environmental awakening. “Through the venture and the thesis, I will gain a wise perspective on the intricacies of humanity’s crucial relationship with water,” McMillin said. Nicholson, majoring in accountancy, Spanish and public policy leadership, will travel to Scotland to find out why financial autonomy is so important to Scotland that it would seek to break away from the United Kingdom. He will interview business, political and academic leaders to understand the financial significance of independence. Perhaps more important to him, though, is to ask his questions of the average Scot. Nicholson, a Trent Lott Leadership Scholar, Taylor Medalist and a finalist in PriceWaterhouseCoopers national case competition, decided to return to Scotland and conduct in-depth research on the independence movement and then write his honors thesis about what he discovers. The two winners were announced at the Sally McDonnell Barksdale Honors College spring convocation Feb. 5, featuring political columnist George Will.